One of my co-workers went to Baltimore last week, and brought back little gifts for all of us. 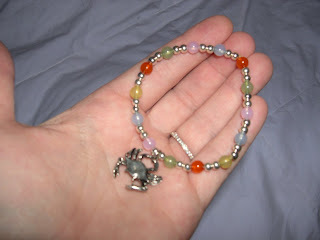 Mine was this cute, tiny bracelet - honestly, when she handed it to me, I thought she had bought a child's size by mistake. But I put my game face on, smiled, thanked her and tried it on - and what do you know? It fit! Color me shocked! I am so used to not being able to just buy an "off-the-rack" necklace - most of them come with a 16" chain, which was too small for my neck. 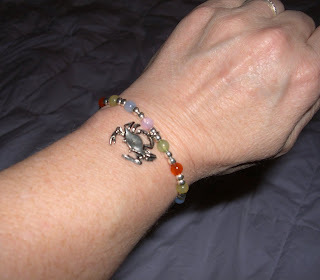 Same for bracelets - like this, the stretchy ones might fit on my wrist, but there would be a lot of elastic showing. I guess my jewelry-wearing body parts have shrunk down to normal size. Funny how those NSV's pop up in the strangest places! Can't wait to pair this bracelet with my orange cardigan - yes, I will be stylin'! Are those flowers on your blog new? Love your observation about the elastic showing...that hit close to home and gave me a good laugh. Style on!! and that is truly a powerful NSV so many people whove never struggled with weight NEVER CONSIDER. Annette - I hear ya on the tummy overhang...something tells me it will be the last thing to go! And the flowers have been here for a while now. Gigi - Glad to hear that I'm not the only one who has seen the elastic show! Carla - Yep...so many seemingly insignificant things that normal-sized people have never "fretted" over! That's great Shelley! It looks really good on you too! I can't wait to be able to wear my wedding ring again. That is a cute bracelet! It seems this is the first of many things that you'll be able to wear that is small!